Kebony has teamed up with enveo to create a beautiful and highly innovative smartphone dock, due to be unveiled at the Copenhagen Design Fair this weekend. The 'Acorn' is inspired by nature and crafted from warm-toned Kebony maple; it embodies simplicity, sustainability and functionality. 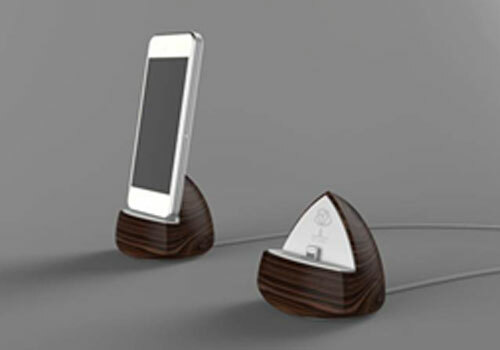 The 'Acorn' strives to occupy the space between the simple and functional iPhone docks that already exist in the market and the high standards of aesthetics that the company has set for itself. Sustainability was an important goal for the designers from the outset. Kebony, with its strong eco-credentials and refined appearance, was selected by the designers who jumped at the opportunity to incorporate timber into their product, fusing it with cold lean steal and functionalistic plastic to give it a subtly modern finish. Kebony's wood is also renowned for its hardness and resilience to wear, contributing to the longevity of this product. The Acorn dock is being design engineered and produced by Wahl&Ross, a company which has manufactured a number of products in the past and who praised the versatility of the material. Drew Rosskelly of Wahl&Ross commented: "Kebony is particularly hardwearing and durable material which can nevertheless be used to craft extremely intricate objects with the right know-how." The Acorn will be viewable at the DesignTrade fair on Sunday 24 August at the Wahl & Ross booth (number E-017A in hall E).